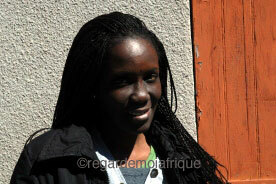 Mame Woury Thioubou was born and raised in Senegal. After a MA in geography at the University Cheikh Anta Diop in Dakar and a diploma in journalism at the University of St. Louis, Senegal, she became a journalist/reporter at the "Quotidien" and for the company Avenir Communication, and technical assistant for Programme Agenda 21 in the city of Matam. In this context she made the collaborative film with the students in her class, St. Louis and Us, and her first short documentary film Face to Face, (17 mn) for which she received public recognition and the award for the best film at the (Festival du film de quartier de Dakar) Neighborhood Film Festival of Dakar in 2009. The history of St. Louis is marked by numerous intermixtures of ideas, cultures and races, for which it has earned the reputation of being at the crossroads between African, European and Arab cultures. Adding to this intermixture, is the legacy of the Signares who gave birth to an original form of savoir-être, which artists have continued to invoke in songs and plays. With its Signares, St. Louis has maintained a tradition that its inhabitants strive to perpetuate through the "Takussanu Ndar." This old St. Louisian tradition consisted of a parade at twilight, in the likeness of the Signares mingling in the streets. Indeed, during the colonial period, Faidherbe square was the everyday gathering place for all St. Louisians, filled with games, music and encounters, where women chatted, displaying their outfits, and also the men, the "ndanaan," who came to have a good look and show off as well. Of course the Signares were present and dressed in their finery, arriving in their carriages, accompanied by their servants. As an awkward, graceless child who looked like a tomboy, St. Louis has always been my idea of feminine beauty. Now that I am in this "center of elegance and good taste that has been the fascination of Senegal and West Africa," I cannot refrain from looking everywhere, all the time, for this highly-acclaimed beauty and elegance. The streets and alleys of the city that once welcomed the "Takussanu Ndar" have been emptied of their beauties because of the hardships of modern life. The desire to be noticed that brought these ladies to life, is now expressed only during important ceremonies: baptisms, weddings and religious songs. It is an opportunity for the young and not so young, to deck out in precious cloth, coiffed in elaborate hairstyles. 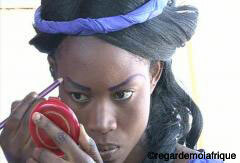 In my film, I investigate the practices of feminine beauty in St. Louis. How do they express it? What are its characteristics? To find an answer to these questions, I pose my camera in various locations. In a hair salon where ladies come to get made up and their hair done; at a shop where they buy beauty products. Moreover, at their homes, I talk to the elders so that they can tell me about the traditions of elegance in the city. And through the metamorphosis of someone in traditional dress and hairstyle, participating in the carnival "Takussanu Ndar", organized as part of the St. Louis Jazz Festival. In order to have a cross-generational perspective: then and now, what are the practices of beauty, what are the changes that have occurred? How do they adapt to the mutations of fashion? Beyond the simple matter of aesthetics that traverse the film, I want to investigate the societal practices as it relates to beauty. Why do women have to resort to artifices to feel beautiful? And in so doing, to what need are they submitting?